Looking for something special? Send us a picture or drawing with your desired measurements for a quote. Please call or email for account qualifying details. Someone will respond by the next work day. Check your spam folder! 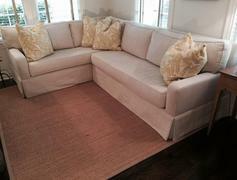 We began with our basic 640-3 sofa and altered it to become a sectional. What would you like? Change the arm style. Add or remove seats. Customize the upholstery. Create a sectional that suits you. We continue to strive to please our customers.